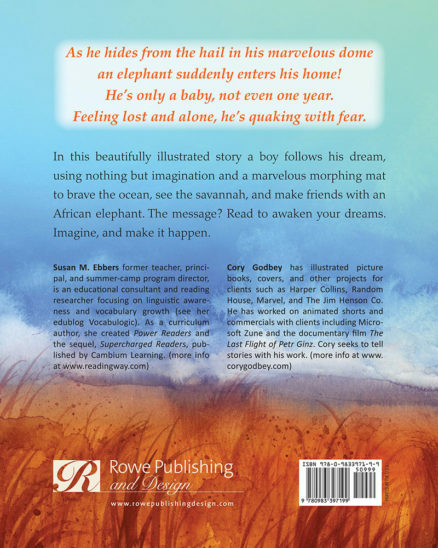 In this beautifully illustrated story a boy follows his dream, using nothing but imagination and a marvelous morphing mat to brave the ocean, see the savannah, and make friends with an African elephant. The message? Read to awaken your dreams. Imagine, and make it happen. As he hides from the hail in his marvelous dome an elephant suddenly enters his home! He’s only a baby, not even one year. Feeling lost and alone, he’s quaking with fear. Susan M. Ebbers former teacher, principal, and summer-camp program director, is an educational consultant and reading researcher focusing on linguistic awareness and vocabulary growth (see her edublog Vocabulogic). As a curriculum author, she created Power Readers and the sequel, Supercharged Readers, published by Cambium Learning. Beautiful illustrations, imaginative adventure story, and a lyrical rhyming rhythm! It even includes questions for armchair or bedtime discussions. This one’s a keeper! Gift for a young friend – Great story that takes a child on a wonderful journey using their imagination. 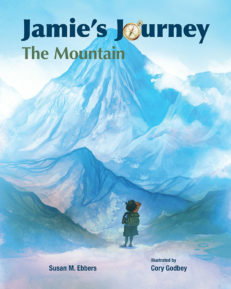 Beautiful illustrations show Jamie’s journey along with the wonderful story. 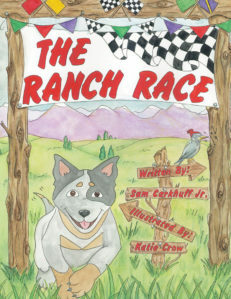 Rhythmic, Captivating, Motivational, Educational Wonderful rhyming children’s book! As a retired teacher, I’d say it’s geared for ages 4 to 8, give or take a year. The story is brimming with imagination and discovery, and the author conveys a sense of joy and amazement at the wonders of the natural world, including elephants, the savannah, various kinds of weather, oceans, etc. It’s unique because it is not only a fabulous story with nail-biting suspenseful parts and totally heartwarming parts. It is also educational, concluding with a page of comprehension and vocabulary questions. The questions are potentially far-reaching, helping readers see how the illustrations and words fit together beautifully to convey the story. The stunning illustrations look like softly textured watercolors. Corey Godbey is a gifted artist. an elephant suddenly enters his home. He’s only a baby, not even one year. The author includes many age-appropriate yet challenging words, like savannah, plain, hail, North, South, dawn, dusk, intentions, slumber, etc. This is sure to boost vocabulary. Having raised my own children with bedtime stories, I liked the beginning, with Jamie in bed reading about Africa, surrounded by posters, maps and books. These props fueled his imaginary journey, and reinforce the notion of bedtime reading. I also liked the inventive ways Jamie changed his mat from one thing to another as he crossed the ocean to Africa to explore the Savannah. This fuels imagination. As a former teacher, I believe this beautifully written story would be a great stepping-off point for teachers or parents to begin discussing their children’s hopes and dreams for the future, and how to persevere in realizing that dream. I preferred the hardcover edition, since it is bigger and sturdier than the softcover, although I have seen the softcover, and both are great. Children and adults will love this beautiful book! Jamie’s Journey: The Savannah has it…the “read it again and again” factor! I am a teacher and had the honor to read Jamie’s Journey: The Savannah with my students ranging in age from 7 to 15. I was teary eyed after observing each child’s eyes light up and face convey a myriad of feelings as they read about Jamie’s adventures with his transforming mat. Susan Ebbers is the Queen of vocabulary, and with her descriptive words that rhyme and have an enthusiastic cadence teamed with the “larger than life” illustrations, each child was launched through a spectrum of emotions–wonder, suspense, fear, joy and delight–while traveling with Jamie achieving his dream. The questions at the end are perfect discussion starters to encourage oral language exploring the rich vocabulary, incredible illustrations, and talk about not only Jamie’s dream, but the hopes and dreams of each reader. A Fabulous Winner for GREAT New Author! I ABSOLUTELY LOVED this book!!!! The use of rhythm and rhyme, along with the stunning images and words, create a sense of having laid down in a bed of creativity, and just letting it roll in you and around you like a melody. I especially liked Jamie’s use of concrete materials, like the posters, maps and books about Africa on his bed that fueled his imaginary journey, and the inventive ways he changes his mat as he visits the Savannah. This beautifully written story would be a great stepping off point for teachers or parents to begin discussing their children’s dreams for the future, and how to persevere in realizing that dream! The cognitive questions at the end were far reaching, helping us see how the joyfully whimsical illustrations and vividly picturesque words fit so perfectly together in this exciting story! I preferred the hardcover edition, since it seemed bigger and much sturdier than the softcover, although both are great! You produced a winner here! Thanks Susan! An imaginative blend of words and pictures! 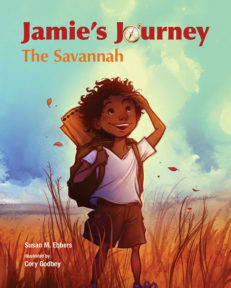 Jamie’s Journey: The Savannah provides children with an imaginative blend of words and pictures designed to engage and inform the young listener or reader. Together the author and illustrator have demonstrated that the whole is definitely greater than the sum of the parts. The illustrations help translate and support words and concepts that may be unfamiliar to the reader. At the same time, the words, presented in a rhyming format, encourage the reader to imagine “pictures” of his/her own. And, as if this wasn’t enough, this story builds vocabulary and background knowledge, two areas of skill development so necessary to reading and listening comprehension. 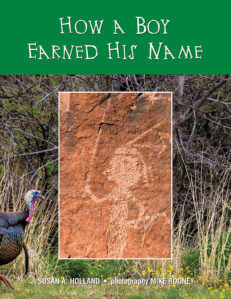 As an added bonus, the author helps the reader (adult or child) to understand the story and explore the vocabulary by providing comprehension and vocabulary-related questions at the end. Clearly we benefit from the author’s rich background in literacy research through this delightful book. In many ways, Jamie’s Journey exemplifies the way books open up the world to children. Through Jamie’s magical experience, the reader sees how books encourage us to imagine and transport us…without leaving home. Bravo for a delightful contribution for children! Jamie’s Journey will lead many young readers on a fantastic adventure. This beautifully illustrated and written book is sure to be a favorite. A “Must Have” to add to your library! Jamie’s Journey; armchair travel for your child Jamie loves to read before bedtime and when he lays his head on his pillow his dreams take him to the faraway places that he has visited in his story books. In The Savannah, Jamie rides on his marvelous mat to Africa where he befriends a young elephant. 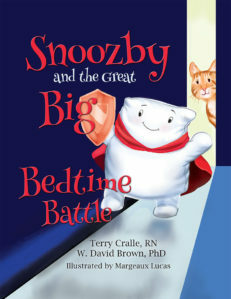 Not only does this adventure book encourage young children to read, to imagine, to dream, and to have hope, it also encourages them to embrace bedtime. Nicely done. This is the perfect book for bedtime or anytime, think of it as armchair travel for your child. The artwork is fantastic and the story is one that my children will always cherish. A great bedtime story plus so much more! Jamie’s Journey: The Savannah is such a great bedtime story because it begs to be read aloud. Its rich vocabulary, engrossing illustrations, and childhood journey via a marvelous mat is sure to requested again and again. Parents and childcare providers can refer to questions at the end of the book (bookends) for guidance on how to discuss this book in more detail. Early childhood teachers, speech paths and parents can reinforce carefully embedded concepts during spontaneous conversation: rhyming, antonyms, vocabulary, geography, animals in Africa etc. I look forward to more books by this author. Jamie’s Journey needs to continue! This stunningly beautiful book can succeed on its gorgeous looks along, but there is so much more to it: bits of astronomy (dawn, dusk, sun rises east to west, viewing Jupiter, Venus and Mars, etc. ), geography (the savannah, Africa, etc. ), and the deep love for books that is engrained in one bright and delightfully-imaginative young lad as we follow his adventures to Africa on his magic mat. Recent research tells us that students who read nonfiction books outperformed students who only read fiction in every way, including comprehension. Jamie’s Journey encompasses the best of both! The simple yet thoughtful questions at the end will focus and test for comprehension as well as encourage students to explore the pictures and words even further. This wonderful book is destined to become a classic, and we look for more from this talented author! A great book to teach children early critical thinking skills. I just received my copy of Susan M. Ebbers book, Jamie’s Journey: The Savannah. I was very impressed! It is a fun, melodious book about a child who has exciting adventures using his imagination, and a mat. The illustrations are colorful, and exciting. I was particularly impressed with the discussion questions , as well as the picture and vocabulary discussion questions in the back. A great book to get young readers exciting and passionate about reading at a young age; no surprise ,considering Susan’s credentials! I would definitely highly recommend this book to parents of grade school children! Susan has done a great job! This is an excellent book. I enjoyed it very much and recommend it to anyone interested in morphemes and word usage in imaginative situations. Got this as a present and my two year old loves it! Beautiful Storytime Reading – There is no frigate like a book to take us land’s away” – Emily Dickinson. Jamie’s Journey will lead many young readers on a fantastic adventure. This beautifully illustrated and written book is sure to be a favorite. A “Must Have” to add to your library! This story has quickly become one of my grandchildren’s favorites. The elephant in the story is so adorable and the illustrations are very engaging. Loved this book!! My daughter and I read it twice the first time! The story is very sweet and shows the beauty of imagination! The words have a nice and easy flow and the illustrations are mesmerizing! I just received my copy of Susan M. Ebbers book, Jamie’s Journey; The Savannah. I was very impressed! It is a fun, melodious book about a child who has exciting adventures using his imagination, and a mat. The illustrations are colorful, and exciting. I was particularly impressed with the discussion questions , as well as the picture and vocabulary discussion questions in the back. A great book to get young readers exciting and passionate about reading at a young age; no surprise ,considering Susan’s credentials! I would definitely highly recommend this book to parents of grade school children! This is a thoroughly engaging book! The rhyming scheme lends itself to a great read-aloud, and the story introduces many concepts that can be further explored in discussion between adults and children. The messages of the power of imagination and importance of future goals are clear and inspiring. The illustrations are a beautiful accompaniment!